My husband & I needed to make a last-minute trip to Kona and we wanted to do some scuba diving with Jack's Dive Locker which is a few blocks away. Anyway, we ended up here. The rooms are large, beds comfortable and the oceanfront balcony makes it nice. Room tip: get an oceanfront room that is on the 4th - 6th floor. the east tower sees more of the actual sunset. 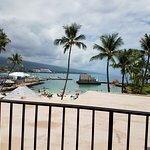 This hotel is very beautiful decorated, loved the artwork and learning about and respecting the Hawaiin culture, the infinity pool a delight, floating around at night with live music was enjoyable, the staff friendly, the location was great, close to everything., rooms very nice. Staying here was a good choice. Thanks for staying with us and sharing your wonderful feedback about our hotel, Hawaiian Cultural artwork and pool area. We’re very happy to see that you enjoyed your stay with us! We hope to host you again in the future. Mahalo! The hotel itself can use an overhaul. It was a bit dated, however for the price it was great! The staff minus one lady was amazing! Rick and one of the bellhops which I forgot his name were simply amazing! They went over and beyond to help! Thanks staff for an awesome stay! Wonderful location. Good comfortable hotel. Desk staff is very helpful. Amenities offered are helpful. Kona is a beautiful place to experience Hawaii. Taxi stand is right outside and so is the public transportation. Did not use the pool as the ocean is right outside but saw many enjoy that part too. ABC store onsite which is perfect for one stop vacation like shopping and the coffee shop onsite has good breakfast options. Thanks for staying with us and sharing your 5-Star review. Thanks for your feedback about our convenient location and our hotel amenities. We also appreciate your kind words about our staff. We hope to welcome you again for another great family vacation! We stayed there for our 35th wedding anniversary “Lava and Java” trip. The hotel was well located for our activities, including helicopter tour from Kona Airport, Coffee Farm Tours and Mauna Kea Summit adventures. The small mall connected to the hotel was very convenient with the ABC store for supplies, and Menehune Coffee for early (5AM) breakfast for our early tour time mornings. Easy walk along sea wall, nearby restaurants and shopping along the bay front. The hotel beach is a great place to watch the sunset, boats and outrigger canoes come in at sundown. The luau was excellent as well, and so convenient to be right in the back yard. Thanks for staying with us and the 5-star review! We appreciate your feedback about how you found our staff friendly, your room comfortable and that you enjoyed our convenient location. We hope to welcome you again!